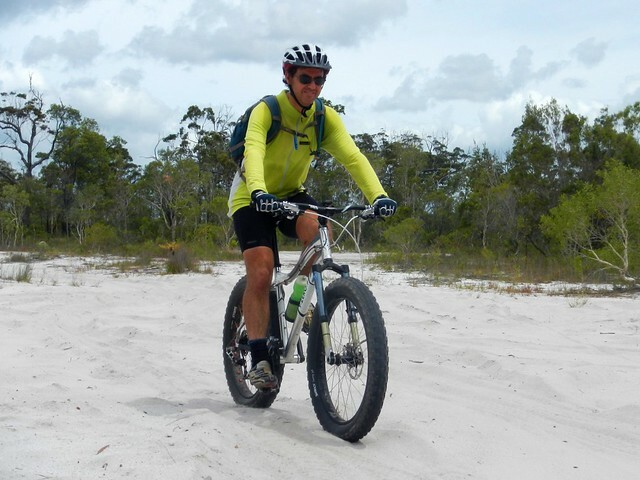 A Fat Bike is a mountain bike with really fat tyres that allows you to comfortably ride on loose surfaces like sand and mud. 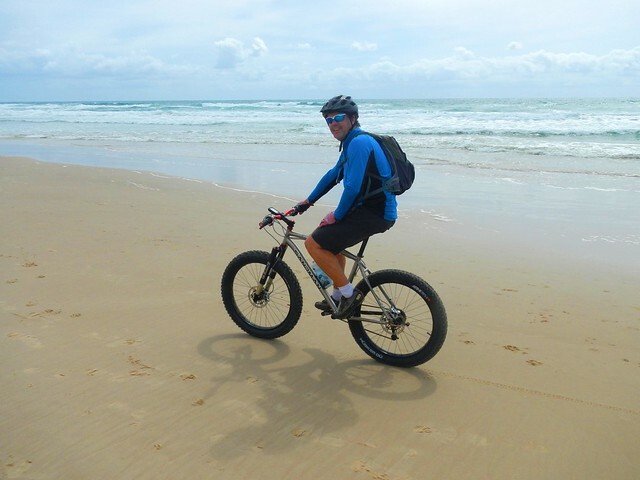 My friend Murray let me ride his spare fat bike (a 9:Zero:7) yesterday while we did a bit of exploring on the trails between Coolum and Noosa. 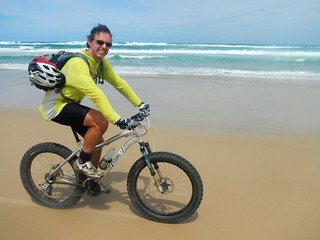 We started our ride heading north on the beach at Coolum. 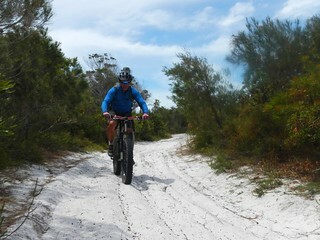 As soon as we hit the sand, I had a manic grin on my face – riding on a long wide beach was so much fun! With the wind at our backs, it was effortless to zoom along the damp sand. People we passed looked at us with a mixture of amazement and envy. Riding a bike along the beach is not something you usually see. 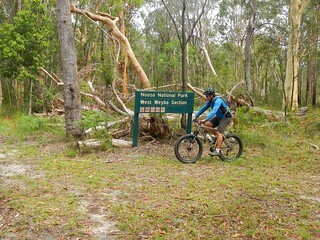 Once we arrived at Peregian Beach, we left the sand, and headed west through the Weyba section of Noosa National Park. 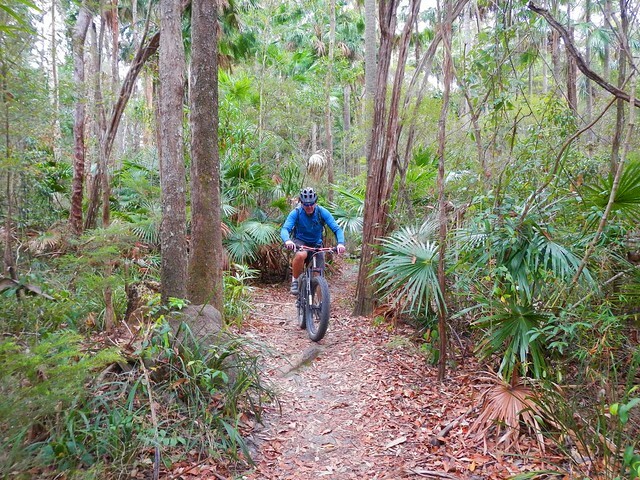 The thing that impressed me was how well the fat bikes performed on normal forest trails. They just soaked up the bumps over tree-roots and rocks. I rode as fast as I normally would on my dual suspension 29er. 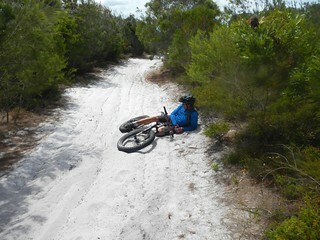 The ride was smooth, and I had heaps of grip from the big tyres. But the rolling resistance was low too. I didn’t feel like I had to fight against any sluggishness from the big tyres…. … but when we DID hit spots of sand, I just floated over the top instead of getting bogged down. 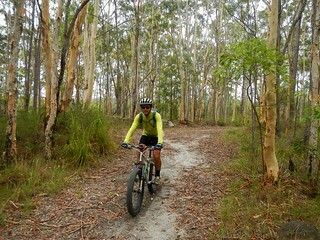 Eventually we made it to Wooroi Forest at Tewantin. Wooroi is a beautiful place. It’s hilly in spots with many of the tracks winding through the rainforest. Murray took me around some of his favourite tracks, and we finished by zipping down a fun new downhill track called “Milk Maid”. The fat tyres on the bike soaked up the bumps while giving me lots of grip on the track. I didn’t miss my rear suspension at all. 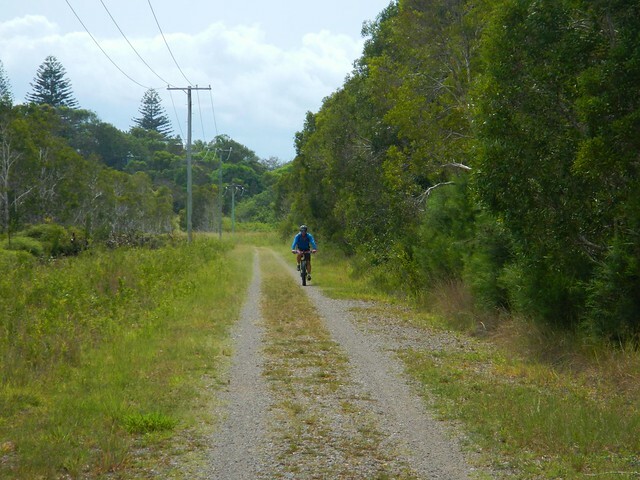 After a bite to eat at Tewantin, we followed a few bike tracks back through the outskirts of Noosa before hitting the sand dunes in the Lake Weyba section of Noosa National Park. 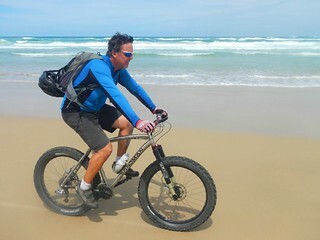 It was quite challenging riding on the loose sand, and took a lot of effort getting to the top of the hills. We both found it difficult to control the bikes in some sections until Murray let a bit more air out of the tyres. We left the national park at Marcus Beach, where we got back onto the beach and rode south back to Coolum. All up, this ride was 61km and took a leisurely six and a half hours including breaks. We climbed a total of 588m, and I burned about 3,000 kcal. I’ll rate this one 7.5 out of 10 on the tough-o-meter. Absolutely 🙂 You get a feeling of freedom riding on a beach that stretches away for miles in either direction. I think you’d enjoy it. Fat Bikes are very addictive – but pretty cheap compared to a full-suspension mtb. It seemed to handle the trails ok too. Next Next post: Why Ride?